I am still suffering from extreme Manda-litis. 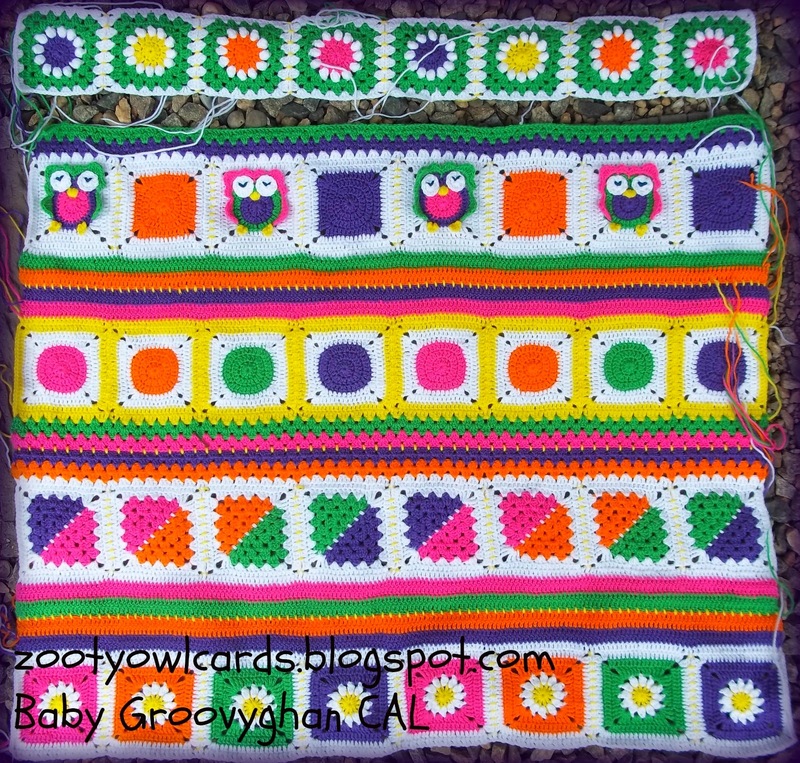 This seems to be having a serious impact on my other crocheting - that is why this post is a little late - I am still playing catch up with my own Baby Groovyghan! I chose the Mirage 4ply, which comes in these cutesy little 25g balls, because it the only locally available brand with a selection of wonderful bright (almost neon) colours! A number of people have asked me where they can acquire yarn in the colours used in this project. Mirage 4py does, however, only seem to be available here in South Africa, but I have noticed that our South African 4ply is more or less equivalent to the Stylecraft Special DK HERE. There are 59 shades to choose from in the Stylecraft Special DK range, among which you will find a lovely bright orange, yellow, a green, a pink and a purple! Deramores delivers worldwide and their service is brilliant! Our final row will be a row of Traditional Granny Squares since no Groovyghan would be quite complete without at least 1 row of grannies! My patterns are all written in US terms. 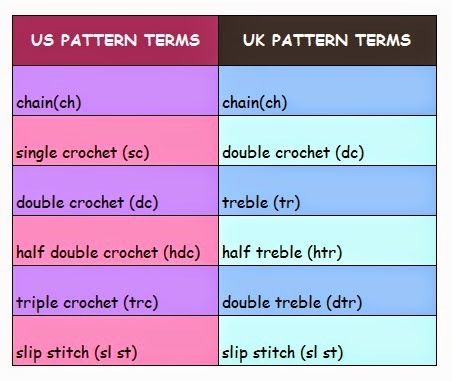 For those readers who are used to UK terms I will be including this little conversion chart in all my patterns for ease of reference. Row 1: Join your white yarn (or whatever colour you are using as your border colour) into the corner 3ch of the first square in the row; 3ch in same place as join (counts as 1dc); 1dc into the top of each dc, when you reach a corner on a block 1dc into corner, 1dc into loop of join, 1dc into corner on next block. Repeat this to the end of the row of blocks. 1dc into the last corner 3ch. Rows 2 - 5: "Granny Stripe"
Row 2: Into space between first 2 double crochet on the wrong side of your work, crochet 3ch, 2dc, *skip two spaces, into third space from hook 3dc* rep *to* to last 4dc, 3dc into space between last 2dc. Row 1: Join your white yarn (or whatever colour you are using as your border colour) into the corner 3ch of the first square in the row; 3ch in same place as join (counts as 1dc); 1dc into the top of each hdc, when you reach a corner on a block 1dc into corner, 1dc into loop of join, 1dc into corner on next block. Repeat this to the end of the row of blocks. 1dc into the last corner 3ch. NOTE: Rows 1, 3 and 5 are worked on the right side of your work; Rows 2 and 4 are worked on the wrong side of your work. For the final row make 8 Traditional Granny Squares. Join your traditional granny squares using the Visible Join. Next week is the final instalment of this CAL - the border!! This is fab! I have just returned from buying wool to make a baby jacket for my friends baby. Mind this looks much more fun!